If you were on Mount Rainier or Mount Baker this past spring and summer—when the snow just wouldn’t melt—you probably saw the latest craze in backcountry snow travel: splitboarding. Local Alpine touring and telemark skiers have been accessing trackless backcountry runs for years, using removable traction “skins” that allow them to climb up and then ski down. But now, thanks to splitboards—single boards that break down into two skis for skinning up slopes and then can be reattached for downhill shreds—more and more snowboarders are discovering the joys of leaving the resorts, lifts and trails behind, and getting out into the millions of acres of formerly unattainable alpine wilds. The seeds of the trend were sown some two decades ago when a few adventurous do-it-yourself snowboarders cut their boards in half and crafted customized bindings and skins to allow them to do uphill ski-style climbs followed by wild downhill board-style runs. But while those rough devices did get many a shredder out into the backcountry, the lack of inside edges and compromised bindings kept DIY splitboarding out of the mainstream. These days, however, the teenage boarders of the 1990s have grown up and gotten jobs, and can pay for a dedicated splitboard. With the splitboarding genie now out of the bottle, upward of a dozen different snowboard and ski manufacturers are offering factory-built splitboards designed from the ground up for enhanced performance both up and down the mountain. The new crop of splitboards from the likes of K2, Atomic, Never Summer, Jones, Prior, Voile and others are torsionally rigid and responsive, despite being two separate planks. “They feature an extra pair of edges running down the center when in ride mode, but when the board is split for touring, you have edges on both sides like a ski, for confident hold when skinning on steep traverses,” says Connor Folley, a 32-year-old marketing manager at SoDo’s own K2 Sports who “shreds the gnar” (translation: snowboards quickly down challenging terrain) every chance he gets. With this new era of splitboards, the only tradeoff boarding enthusiasts have to make is parting with a cool grand or so for new gear. Folley says that splitboards have opened up a whole new world of snowboarding for him and thousands of other local shredders. Of course, splitboarding isn’t for the faint of heart. 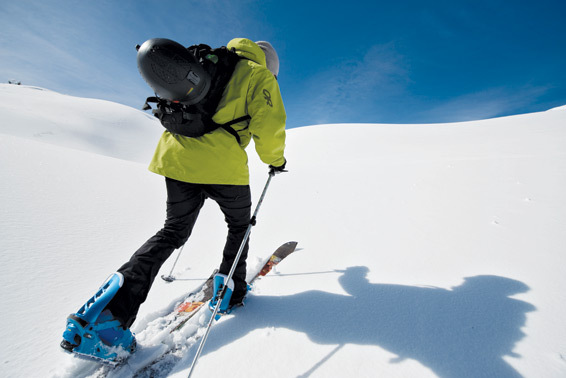 Avalanches are the primary risk, and splitboarders should wear a helmet and carry a pack containing a shovel and probe, an avalanche beacon, and adjustable poles and skins. Novices can either tag along with expert friends or the pros at Pro Guiding Service (North Bend, 108 W North Bend Way; 425.888.6397; proguiding.com), or take a lesson from the American Alpine Institute (Bellingham, 1515 12th St.; 360.671.1505; aai.cc) or any other of a dozen or so Alpine schools around the greater Puget Sound area. You can also learn more about the sport, and read message boards by splitters from all over the country, at splitboard.com. Once you’re up to speed, the options are practically endless. 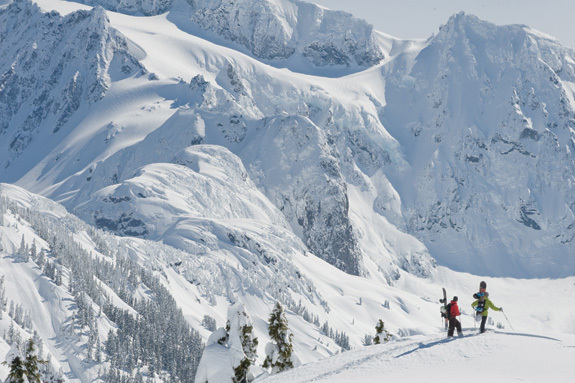 The Mount Baker area is the Northwest’s mecca for backcountry skiing and snowboarding, and offers moderate approaches from the resort parking lot, as well as the annual Mount Baker Splitfest (March 25–27; splitboardfestival.com). From Baker, the whole North Cascades range unfolds, beckoning as skills blossom. And, of course, skinning from Paradise up to Camp Muir on Mount Rainier and blazing new trails down is a perennial favorite and practically a Northwest rite of passage. Even skinning up and riding down the runs at area ski resorts after the season closes can make for some exhilarating boarding. For more info on where to ply that splitboard, look for the ski logo on Washington map overlays on Trails.com. Try before you buy by renting a demo splitboard from Seattle Ski & Snowboard (Shoreline, 14915 Aurora Ave. N; 206.548.1000; seattleski.com) or try the Snowboard Connection (two locations, including South Lake Union, 263 Yale Ave. N; 206.467.8545; snowboardconnection.com). The latter will also split an old board for you and add the necessary hardware for less than half the cost of buying a new dedicated splitboard.